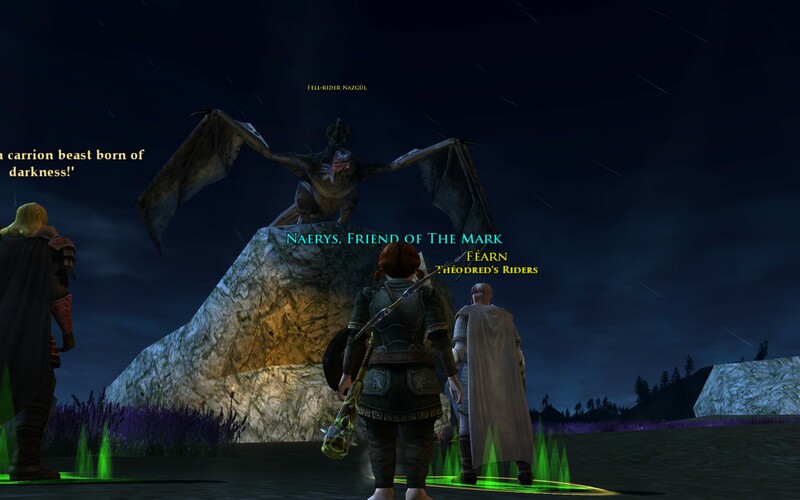 I’ve been on a bit of tear in LoTRO, trying to “catch up” before Riders of Rohan releases later this fall. Plus, the higher level I get, the more I want to hit the level cap, and then shift attention to the storyline, crafting, legendary items, and skirmishes. I enjoy the landscape and various scenic views, so adventuring for long stretches of time is fine with me (especially when I have that opportunity, which doesn’t come that often). Naerys became a bit of an arsonist in the Gap of Rohan – setting fire to huts, burning supplies, but hey it is for a good cause! At the top of the hill in Heathfells, I entered an instance to assist Théodred’s Riders in their battle against local tribesmen. I had to burn 4 enemy flags, defend Grimbold, and defeat the enemy captain, Rurud. Waves of enemies ran into our defenses, and after a few fights, I left my allies and searched for enemy banners to burn. Unfortunately, after burning 3 flags and making my way to the 4th, Grimbold fell and I failed the instance. I was sure the cause for this was me getting involved in too many 2- and 3-on-1 fights around the banners. I survived, but they were time consuming. So the next time, I stood at a distance from the banner, used my bow to draw the lone sentry over to me, and stayed away from additional aggro. When the coast was clear, I ran in to light the flag on fire and proceeded to the next flag. This went much faster and after burning all flags, I returned to find the enemy captain battling my allies. Grimwold’s morale was midway down, so he was not in any danger of defeat. 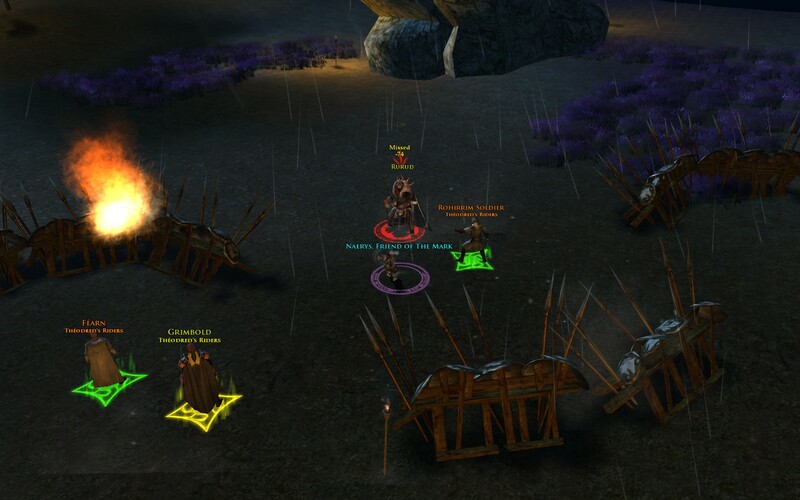 I was able to taunt all the enemies to me, and settled into a battle with Rurud, with some help from a Rohirrim soldier. 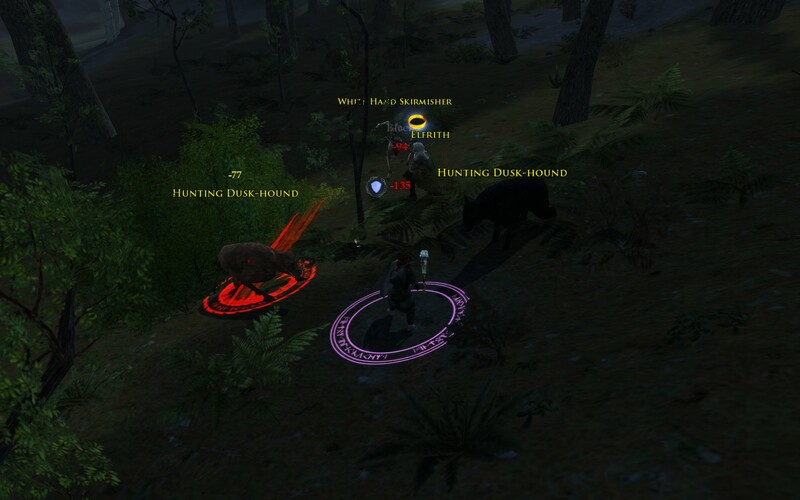 We eventually defeated him, only to be taunted by a Nazgûl from the top of a rock! The foul beast left a warning about Mordor’s growing strength, before flying away. My monk Aurora is almost level 3… level 2 rank 9 with about 2/3rds the way to go. I finished the two quests from the Leaky Dinghy, and moved on up the ramp to the Harbormaster’s Plaza area, featuring the giant fountain above. While mousing over the fountain, I noticed it was “usable”, so I did it… and a list of founding guilds popped up (I think?). 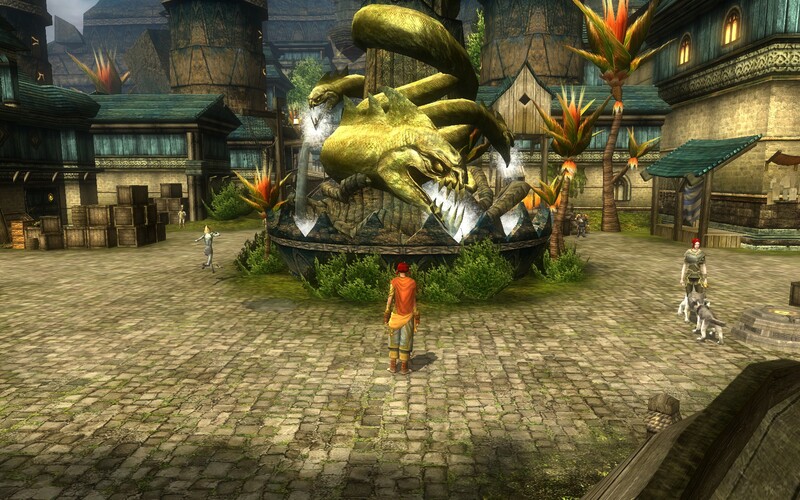 Pretty cool to have an in-game monument! Aurora suffered her first death in the Kobold Twins adventure, given to me by Durk the Deranged. After killing the Witch Doctor Rakhat, I went to loot his chest, and was sprayed to death by an acid trap. Oh well, live and learn… I received a warning about sensing nearby danger, but I didn’t think it would be fatal. Of these, the two most appealing to me are Way of Earth and Way of Water. I’m inherently a defensive, cautious player, so bonuses that enhance defenses, health, and so on are what I like to see. I lean towards the Earth elemental path because that gets so many bonuses! The reality is I don’t always get to invest “a lot” of time during a preview weekend, but am I happy to dabble as much as possible. I only got to play a bit more, advancing my Asuran mesmer just shy of 5th level, along the story line where Zojja has been captured and we need to break in a free her. I haven’t had an underwater adventure since, gee I guess it would be World of Warcraft or an Elder Scrolls game. There were some short swims in DDO but no combat that I’ve seen (so far). I generally don’t like underwater because of the difficulty with 3D navigation, plus the time limit on your character’s breath. 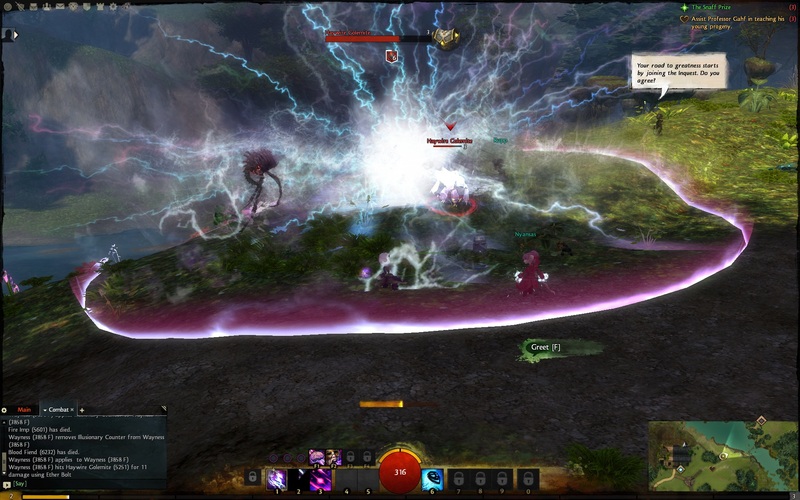 But that concern was addressed quite nicely here in GW2 – no breath timer! This was fantastic as I could then concentrate on the quests, combat, moving in 3D, and not have to keep checking how long I had before drowning or running out of air or what have you. 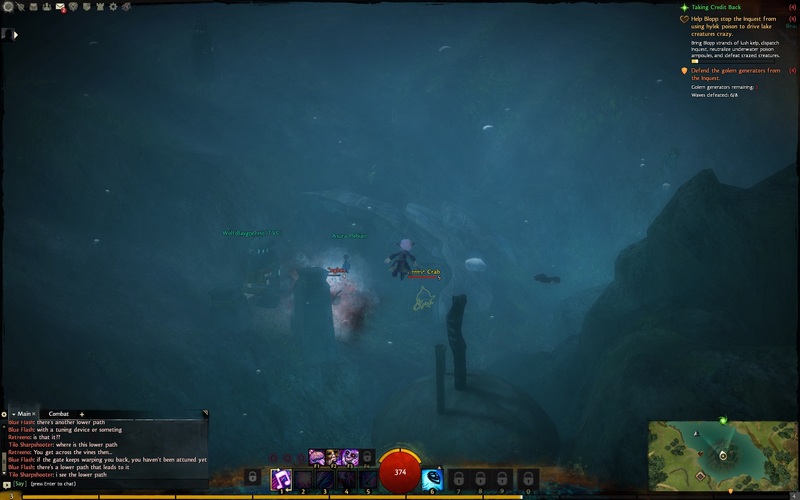 I also noticed that my skillbar changed when underwater, and combat eventually unlocked other skills. That will be another dimension to consider while playing. Before plunging in for my aquatic adventure, I tried out the RC Golems, which was fun. On Friday the area was jammed I could never get a station, but now everybody has moved on so it wasn’t a problem. Golem combat is simple: give them instructions (turn left/right, move forward) and attack the enemy golem. I fortunately had the benefit of playing the AI two times, which let me have the initial attack and thus the upper hand in the battle of attrition. 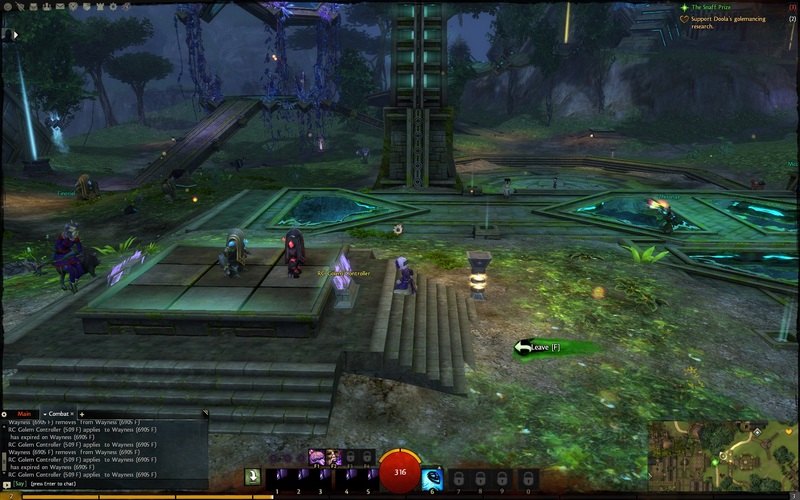 I couldn’t resist a little playtime in GW2, so I patched up my client and logged in the game. I guess Anet did a character wipe because I had zero characters leftover from earlier previews. It’s something I expected anyway. First up I created an Asuran mesmer. Early in the Metrica Province I helped Professor Gahf teach young progeny by using a teaching apparatus to summon various demonstrations: Advanced Pyrokinetics, Energy Creation, or Golemancy 101. Each choice resulted in a distinct visual effect and summoned a foe to defeat. This was fun and self-paced, as the teaching apparatus spawned enemies. I completed this and ran over to continue my story, but decided to log and quickly try out Sylvari. 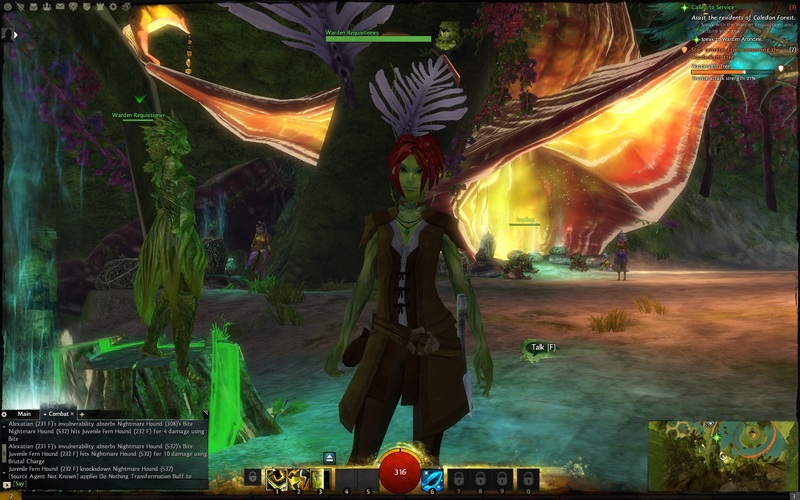 I created a Sylvari ranger, choosing a Fern Hound as my animal companion. I had even less time here, and stopped right after reaching the Caledon Forest and getting my clothes back (which were oddly stripped away at the end of the intro area boss fight). And despite wanting to play more, I have to stop as I’m nearly dozing off at the keyboard. I should have a few hours to play over the weekend and hope to make a little more progress. 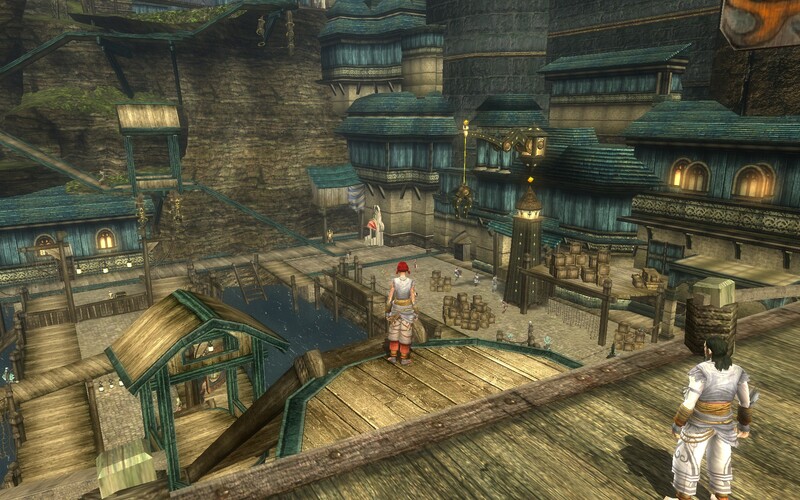 In the meantime, it was really nice to glimpse the Asura and Sylvari worlds! 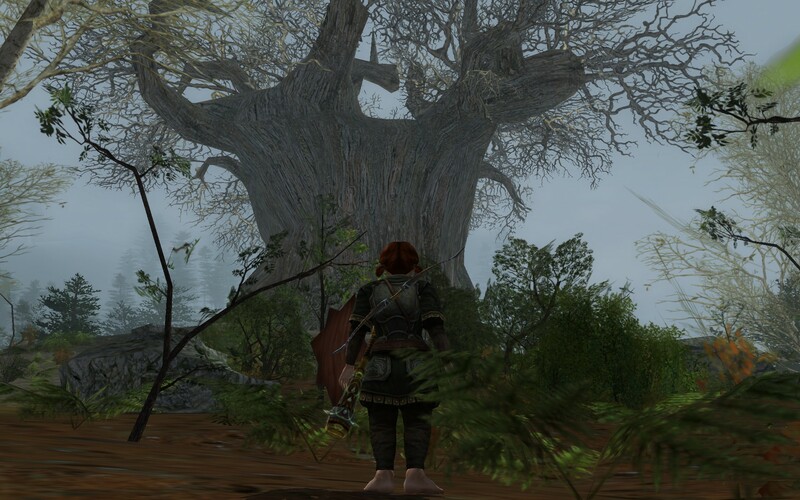 I took stock of the games I’m currently playing (LoTRO, DDO, Fallen Earth). The thing is, I really enjoyed Guild Wars (playing it obsessively for two years, to the point where I burned out midway through taking one char through EoTN) but Guild Wars 2 will be different for me. First: it has competition from other MMOs, so my time is naturally constrained – Guild Wars had no consistent rival when I played it the most. Second: it is a new and different game – related, but different. I’m sure I will enjoy it quite a bit, but probably not to the exclusion of the other games I am also having fun playing. The real “losers” in this situation are some games I’m interested in, but can’t squeeze in: SWTOR, and EVE (subbing again, in this case). Trying to play 4 MMOs is already crazy enough, so adding more isn’t worth it. This isn’t even directly about paying a monthly fee – I just can’t imagine trying to split time between 5 or 6 games and actually rotating through consistently enough to remember what to do 😉 or feel like I’m making progress! I remember playing EVE ~2 years ago; if I only could spend 2 hours a week playing, I’d spend all my in-game time fiddling with my skill queue. Maybe that is specific to EVE – I think it requires a certain minimum amount of time per week to be worthwhile. Possible exceptions included training a very long skill. But that wouldn’t be the case for starting up a new character. At the base of this tree I found some disturbed earth, and when I dug it up, an evil spirit spawned. This yielded a clue which meant something to the scouts at the nearby camp. 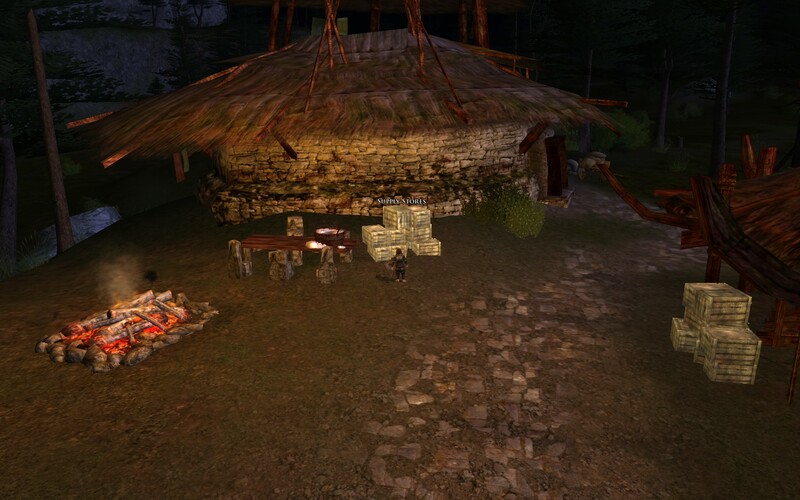 Naerys wound up helping various scouts scattered throughout Gravenwood, except for Elfrith in the southeast. This scout was either a genius or a fool, by choosing his hidden location in the spawn path of multiple enemies. I know I’ve played all this content before, but the nice thing about deja vu is that this time around I can work on the finer points of being a monk. Which is to say, practice (build up muscle memory) for finishing moves. At level 1, it is even easier, because I only have the 4 elemental attacks (earth, air, water, fire) and the 4 finishing moves those lead to. More options come into play later, but for now this is good. So I’ve been racing around Korthos Island to complete exploration deeds, and plunging into battle without too much planning. Most of the fights (outside at least) are not overwhelming. Besides, in this game, combat works a bit faster. After clearing out a handful of enemies guarding a mountain peak (“Watchful Vigil” exploration point), I took in the view. Later I wrapped up Korthos Island and adventured to Misery’s Peak, the final dungeon on the island. Misery’s Peak is a fun one, but I think the pacing is off – mostly because it is literally as long as all of the rest of the dungeons on Korthos Island put together! It goes on and on and I think could be roughly 20% – 30% shorter if it cut out one of the sections that has you clear out an area in order to flip two switches so a door rolls open for you to continue. 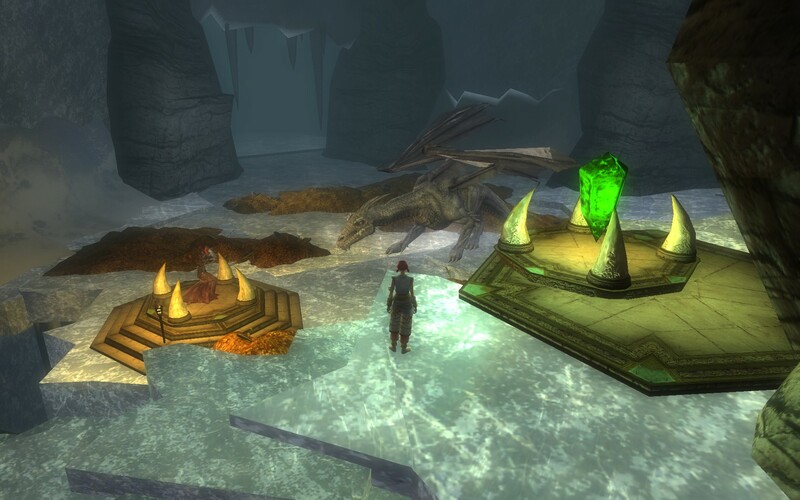 Not to trivialize the content – it is a fun dungeon – but it needs an editor. In any case, I emerged victorious and sailed away to Stormreach for the next stage of adventure! After some time passes I may try the dungeons on Korthos Island again, at a higher difficulty level. Finishing a dungeon unlocks a higher difficulty level, and I’m curious if the rewards (xp and loot) are worth a repeat adventure.